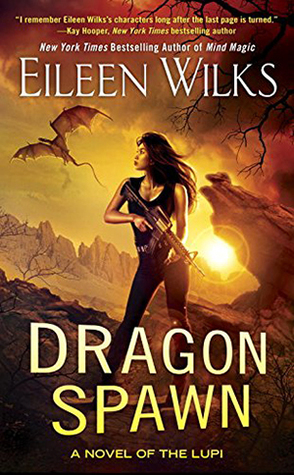 Dragon Spawn by Eileen Wilks is the latest book of her World of Lupi series. 1. I really enjoy this series. The characters and the story lines are usually so good and keep you guessing. That being said, this is not my favorite book of the series. I felt Wilks dropped the ball a little with this book. One of my favorite things about this series is the relationship between the featured couples, whether is be Lily and Rule, Cinna and Cullen, etc. It just wasn't there in this book. It felt like Lily and Rule were not connecting as well as they usually do during the stories. 2. I did, however, enjoy the story itself. I like that Wilks plots out interesting twist and turns to get to the end game. I liked that Wilks spent a little more time focusing on Toby's point of view, and getting to know him as a character better. I cannot wait to see what kind of roles he plays in upcoming books. Plus, I liked finding out that Weng is a dragon spawn, and what exactly that entails. 3. Be warned, that Wilks ends this one in a cliff hanger, and a little bit of a confusing one at that. I have so many questions on what exactly happened and where she is going with the story. Overall Read because I think it will be important for the series overall story.